This weekend, award-winning filmmaker Darius Clark Monroe returns to the scene of his crime. The Houston native will be back in H-Town for screenings of Evolution of a Criminal, his extraordinary autobiographical documentary, at the Alamo Drafthouse Vintage Park. But wait, there’s more: His attendance at post-screening Q&A sessions Friday and Sunday will cap off what has turned out to be a week of singular achievements for the University of Houston graduate. Just two days ago, Monroe successfully completed a Kickstarter campaign to fund a wider release for his film. A few hours later, the International Documentary Association announced his selection as winner of the IDA Emerging Filmmaker Award, a prestigious honor that provides $5,000 in cash and a donation of post-production services valued at $50,000. As one of Monroe’s former teachers – he was in my Broadcast and Film Writing Class at UH a decade ago – I am unabashedly proud of what has he has done. And, yes, frankly astonished by how far he has gone. For the benefit of those who tuned in late: Darius Clark Monroe was a straight-A honors student at a Houston high school until the morning in 1997 when, along with two companions, Pierre Murphy and Leroy “Trei” Callier III, he held up a Bank of America in nearby Stafford, Texas. Brandishing an unloaded shotgun, and disguised with Halloween masks, the neophyte bandits made off with $140,000 in cash. But Monroe didn’t get to enjoy his ill-gotten gain for every long. Four weeks after the crime, he was arrested. Monroe was tried as an adult, and served three years of a five-year sentence. After that? Well, to paraphrase one of Strother Martin’s more colorful lines from Cool Hand Luke, he got his mind right. 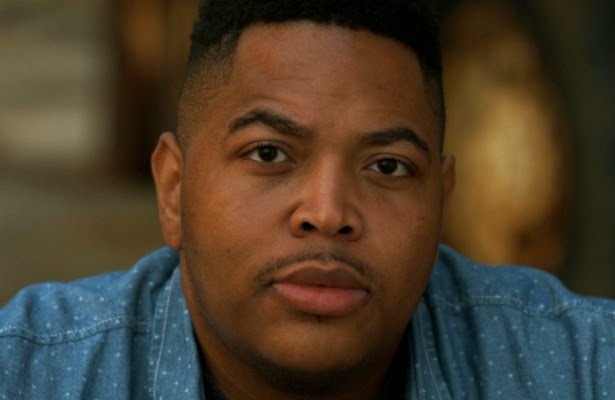 He graduated with honors from University of Houston, then went on to attend film school at New York University – where he studied under Spike Lee, who served as an executive producer for Evolution of a Criminal. 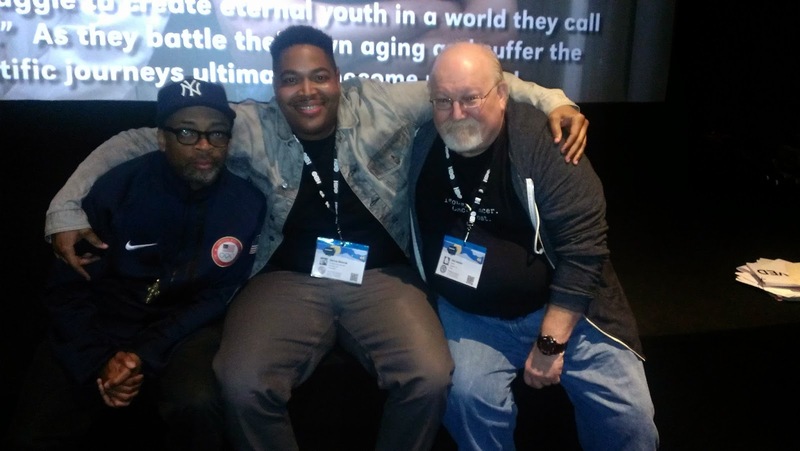 Spike and I were on hand to cheer our former student when the documentary had its world premiere last spring at the SXSW Film Festival in Austin. Three days after the screening, I sat down with Monroe to talk about what he did, what he’s doing – and what he hopes to do next. OK, as bad as the bank robbery turned out for you – and I would say having to serve three years in prison, and picking cotton out in the hot Texas sun, is pretty damn bad -- there are two ways this could have turned out much worse for you. One, somebody in the bank could have been packing heat, and shot you very dead. In Texas, let's face it, that's a very real possibility. The other way it could have been a lot worse is -- you could have gotten away with it. You ever spend a lot of time thinking about those two possibilities? Monroe: The third possibility is someone else -- Pierre or someone -- could have got shot as well. I have thought about all three, especially the first one you just mentioned. When I think back about the fact that we walked in there -- it's almost frightening. Because I could never do it now, at 33. We were sitting ducks. The fact that somebody was not shot and killed... wow. Had a customer or had an undercover cop been inside the bank and shot and killed myself or Pierre, they would have had the right to. They would have had the absolute right to. They wouldn't have known the shotgun wasn't loaded. Monroe: They would not have known it. They would not have known it. That response would have been warranted. That sits with me the most because it's not uncommon for that to happen, for somebody who's already in there having a concealed weapon ‑‑ especially in the state of Texas. There's something about youth and being reckless, I guess. Reckless abandonment. Because I have no idea how we thought it would be safe to just walk in, run in. We tried to rationalize it, but it haunts me to this day. I feel very fortunate that I am alive, and that everyone inside the bank is alive, that no one was physically harmed. Because the odds of that happening were astronomical. I believe that something in the universe, something much greater than me, was in charge that day for whatever reason. [Laughs] I think about that all the time. All of the time. Not getting caught is also something that fascinates me. I always wonder, what does that mean? [Pause] You know what, Joe? The thing is, I just know my personality. I'm one of those people who need to... Well, when I was 16, at the time, when I made a mistake, I needed to see a harsh punishment before I learned my lesson sometimes. I'm not saying [a punishment] as harsh as picking cotton in the prison. But a slap on the hand? I would not have learned my lesson. You see what I'm saying? Had I just walked into that bank and we robbed it, and I would have never been charged and nothing ever happened -- I probably would have stumbled into crime again. It would have felt too easy. It would felt like, "This is something we could get away with." I can see how that would have just opened up this monstrous side of me that I wasn’t aware of. I could just see how that would not have been a good thing. [Laughs] I tell people, "As much as I hated to go to prison, that experience really did reorder and realign my life in the right direction." Because otherwise, I probably would have gone down a path of crime. Monroe: I was in Midway, Texas, which is 40 minutes outside of Huntsville, for three years. At what point in that three‑year period did the light bulb go off over your head, and you thought: "You know, I could make a movie out of this?" Monroe: Never. When I was in the place, I had no idea that I was going to ever make a movie about this whole situation. The truth is, once I got out, I did not want to talk about the situation. I feel like I was just driven, like I was almost on some type of high, some drug. I really wanted to distance myself further and further away from the robbery, the prison, everything that had happened. I was trying my best to do it, and then it just came full circle in film school. In film school, they talk about getting personal and digging deep. I realized there was this thing weighing on me and that I wanted to talk about, finally. I knew nothing about your past when you were in my class at University of Houston. But I will say this – and I’m not stroking you: I’ve been teaching there for nearly 15 years, and I think I could count on the fingers of one hand how many students I’ve had who were as diligent about turning in their work, and concerned about their grades, as you. And I told Spike this the other night after the premiere ‑‑ you're the only student who's ever gone to the trouble of seeking me out and wanting to go over every single assignment to make sure you got the right grade for each assignment. All of which makes me think: Once you decided to go down the straight and narrow path, you weren't going to take any detours. You were going to keep your pedal to the metal. Monroe: That’s the truth. I was just telling the two guys from the National Film Society that the idea that I wrote down, the feature treatment idea that I wrote in your class, was the feature treatment idea that I submitted to NYU for the application. It's a feature film that I want to do in the next three years. It's not something that has gone away. These are just things I just keep filed in the back of my head. After the doc, I want to do a feature titled The Year of Our Lord, but then after that, it's the feature film I want to do next. [Laughs] In that class of yours, I was working on the treatment and trying to figure it out. I'll never forget pitching it to the class. Like I said, I believe the universe works in very auspicious ways. Even when we took that picture at the premiere, I was just saying, "This is so..." It was an out‑of‑body experience. In the documentary, you talk to Spike and some of your other teachers at NYU about how they were surprised when they learned about your background. In fact, one of them says he might have had second thoughts about making you a graduate assistant. Were there people who didn't want to talk on camera about what their response was to your record? Who actually had started to, you know, treat you in a different way after you told them? Monroe: No. At NYU, I could have interviewed anyone. It really is a weird situation. Again, I think about perception. They had known me for many years at that point. I had been a teaching assistant, a graduate assistant. I was a resident assistant. Even after they found out about the whole story ‑‑ I had my pre‑thesis review ‑‑ it was difficult for them to have a knee‑jerk reaction, like, "I can't trust this guy." We've had drinks. It's a very familial environment because it's such a small faculty and small student body. I don't think there was one professor who would have turned down an interview request. And even since then, after I did the interviews, back in 2007, NYU hired me on as a full‑time TV studio manager, with a felony on my record. It wasn't like they didn't know what was happening. They knew exactly what was going on, yet they still trusted me to do the job that I'd been doing since I got there. To get back to the first question: Do you really think you would be here now if you hadn’t been caught? Monroe: No, I don’t think so. [Pause] I don’t think so. Do I think I would be here now had I not done the robbery? Maybe. But if I was not caught, I’m sure I would be in prison for something else right now. I’m pretty confident in saying that I wouldn’t be here. But at 16, bank robbery seemed like it might be a viable option. Monroe: Well, like it says in the film, I was really bothered by the whole situation at home. It was annoying to me. I was young, and I knew that there was something in me that was exhausted by the whole financial strain. I was willing to go to lengths that probably were completely unnecessary -- but for me, it felt like in my head that this could be done. This is something that could be done to help out. This was something that could be done. But I don't want people to think this is just some Robin Hood story. I was still a kid. I still wanted some nice sneakers. I still wanted some nice clothes of my own. I think getting arrested and going to prison straightened me out. Of course, the funny thing is, even back then, you already were a director. This robbery was your idea, was it not? You did mastermind it. I used to tell people when I first heard about the robbery, "Well, I guess he fell in with bad companions back then, because he was such a great student when I had him." But then I'm watching the documentary, and I’m thinking, "Damn. Darius was a little budding criminal mastermind at 16." But also, it’s like, "Hey, he was already writing the script and directing it." Monroe: In my mind, it didn't feel like, oh, I'm going to be the mastermind behind it. I was like, "I want to plan it out and get you all to follow along with it." But it's so funny, Joe: A lot of people, when they hear about the story, they're like, "Well, so who influenced you? I know you fell in with the wrong crowd." I'm like, "I didn't fall into the wrong crowd." Again, I always think about perceptions. We really have this bogeyman, in terms of what we think a criminal is or who we think a criminal is. Folks say, "When I would meet you, you don't look like a criminal." I always say, "Can you describe to me what that looks like?" Hopefully, the film debunks and demystifies, and forces people to think, "Oh, well, maybe I don't know who's capable of committing a crime." I feel like more people are capable of doing something illegal or criminal, something they would never think they’re capable of doing, than we might think. I think a lot of people, most people, want to follow the law. But I think some folks, when their back is pushed against the wall, may make a choice that is illegal. Who do you hope this film reaches? Monroe: I really, really, really want to get this film to a lot of young men -- black, brown, white, Asian, just a lot of young men -- who feel like they have been left behind, who are on the road to making a mistake. I hope the film can get them before that happens. And if they've already made a mistake, they're already in juvenile, if they're already in prison, if they already are on parole, have a record -- I'm hoping that the film also inspires them not to be stuck in that space where this mistake consumes them and is their life. I've met a lot of guys who have a record, have a felony on their record, and just feel like, "I can't do anything. I can't. I can no longer dream. I can no longer move away from this." I don't believe that. I really, strongly don't believe that. And not just crime. I feel that people just should not be forced to suffer for any mistake for the rest of their lives. Outside of that audience, I'm hoping on a wider level that [the documentary] helps individuals understand that forgiveness and compassion are two things that we should start practicing in reality, as opposed to just speaking about it. We should think about that. And I know it's not easy. Look, there are people that I have a hard time forgiving myself. Do you believe God has a plan for you? Monroe: I do. Absolutely I do. Absolutely. I look forward to screening this movie for my students down the road. But I'm going to tell you something: After I screen the movie, I plan on saying, "OK, now you've seen this. I want you to understand my attitude: None of you have any excuses." Monroe: It's the truth. [Laughs] I agree, I agree, I agree. I just hope you don't mind being used as a teaching tool. Monroe: No, not at all. [Laughs] Not at all.